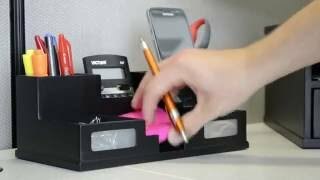 The Victor Midnight Black Collection™ brings a fresh perspective to desk accessories by offering functional solutions with appealing design elements. 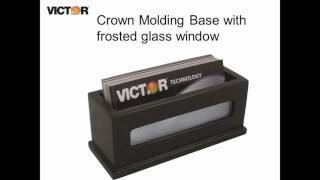 The 1156-5 Business Card Holder provides an open design for easy use with a crown molding base. Holds up to 60 business cards. Features sturdy wood construction with a durable double coated matte black finish. Frosted glass window adds a touch of class. Non-slip rubber feet reduce movement and protect your work surface from scratches and scuffs. Stylish 4.8” x 1.8” x 1.75” design makes a great addition to any desk. Perfect for use either at home or in the office. 90 day manufacturer warranty.